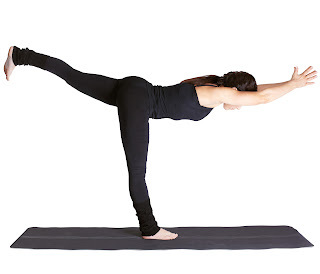 The Skinny - HEALTHeME's Official Blog: Our Favorite Yoga Poses For Your Legs and Glutes. 3 Great Poses To Tone Your Legs! Are you ready to rock your asana (a.k.a. a yoga pose)? Yoga is well known for being a great stress-buster, but yoga is also a great way to build strong, toned muscles. Move-over Madonna arms: these 3 super poses are all about your lower half! Try to hold each of the following poses for 3-5 breaths. Chair Pose (also called fierce or powerful pose): Stand with legs hip-width apart. Inhale and reach your arms overhead. As you exhale, bend your knees and press your hips back and down as if sitting in an imaginary chair. Make sure your knees stay behind your toes – you should be able to see your toes when you look down. Keep your chest lifted and abdominal muscles drawn in as you hold the pose for several breaths. Come back to standing. Benefits: This pose strengthens the muscles of the quadriceps, glutes, and improves core strength and stability. It also improves the flexibility of your calves & ankles – which is especially helpful if you frequently flaunt high heels. High Lunge: Step back with your right leg so that you’re in a wide stance. Keep your right heel lifted and toes pointing straight ahead. Inhale and reach your arms overhead. Exhale as you bend the left knee, keeping the right leg straight. Engage the thigh muscles of the right leg and keep the right heel off of the floor. Make sure to keep the left knee directly over the ankle and don’t allow the knee to move in front of the toes. Go only as low as you can and hold for several breaths before switching sides. Benefits: The muscles in both legs will be strengthened plus, you get a nice stretch for your hip flexors, so this pose is a great way to counter a day spent seated at a desk. Warrior III: From a standing position, bring all of your weight onto your left leg. Begin to shift your body weight forward and lift your right leg off of the floor. Keep your spine long and tall as you continue to lift your leg and bring your upper body forward. Eventually, you will try to align your upper body and right leg parallel to the floor. Your arms can either stay by your side or extend and reach forward. Make sure your abdominal muscles stay engaged and your spine stays in a neutral position. Try to resist the temptation to move forward onto your left toes; work to keep the entire foot grounded and muscles of the left leg engaged. Hold for several breaths before switching sides. Benefits: This move not only gives your glutes a strong lift, but it also improves your balance.